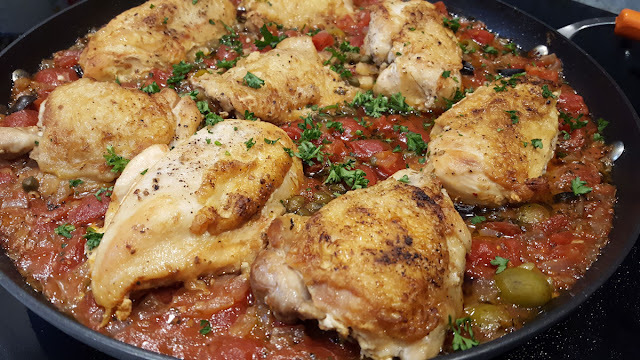 Are you tired of the same old chicken dishes you've been making week after week? Are you looking for a dinner recipe that is easy to make but tastes like you spent all afternoon preparing it? This easy Skillet Mediterranean Chicken dish is just that recipe. I knew I had a winner when my oldest son, a pretty opinionated presence at my dinner table, told me this was "one pretty fabulous dinner". Who can argue with that? I used bone-in chicken thighs and boneless chicken breasts with the skin on because some in my family prefer one or the other. I like to use breasts with the skin on for dishes like this because it seems to keep the breasts from drying out. It's not always easy to find boneless, skin-on, chicken breasts in my local grocery store so I just buy the bone-in breasts and debone them myself. It also saves quite a bit of money to debone the breasts yourself. Who doesn't like to save money? You can easily debone chicken breasts, too. I've made a two-minute video to demonstrate just how easy it is. Much of the flavor in this dish comes from the olives and capers but you won't want to skimp on the Italian seasoning. It pays to purchase a good quality Italian seasoning mix to keep in your pantry. I have come to love both the Sicilian and Tuscan dried herb mixes I find at Home Goods. I think you'll love that this is a quick dinner made from beginning to end on your stovetop. On average, it takes me about forty minutes to prepare this dinner. I usually serve it with either broccoli or asparagus and a green salad. You could serve it over linguini or another pasta, too. You'll want to be sure you are using a large enough skillet for this dish. 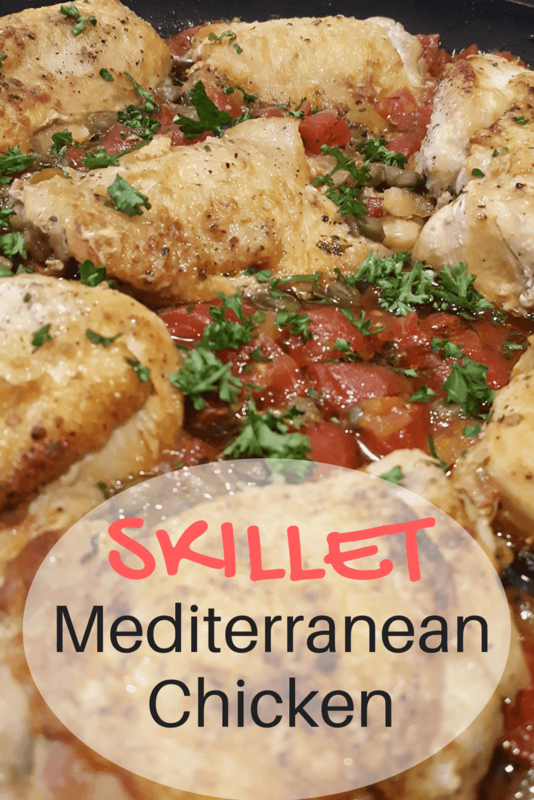 My 14-inch skillet is large enough to hold eight chicken pieces and the sauce for this dish. Approximately one hour before cooking, rinse and pat dry the chicken. Mix together the salt, pepper, and garlic powder. Toss the chicken pieces in the seasoning mix and set aside. Heat the olive oil in a large skillet over medium-high heat. Place the chicken pieces in the hot skillet, skin side down. Cook until the tops are well browned, six to ten minutes. Turn the chicken over and cook for another five minutes. Remove the chicken from the pan. Pour off the excess fat so that there are only about two tablespoons in the pan. Reduce the heat to medium. Add the onion to the pan and cook until translucent, about three-five minutes. Add the garlic to the pan and cook for a minute. 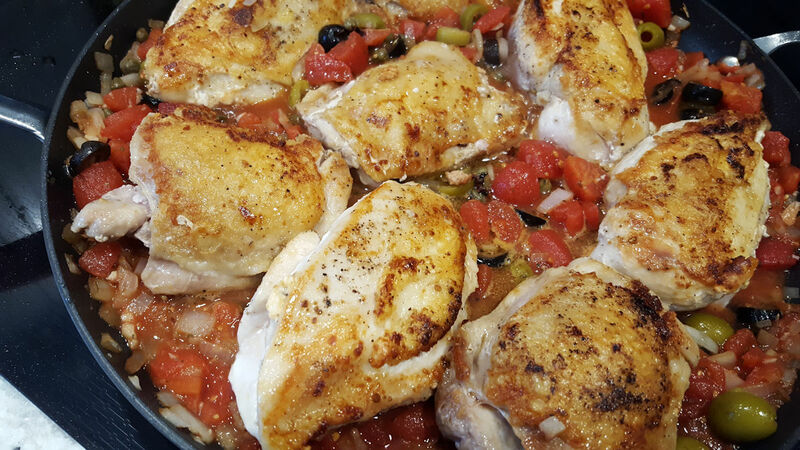 Add the tomatoes, olives, capers, and Italian seasoning to the pan. Bring to a boil. Add the chicken back into the pan. Reduce to simmer. Cover the pan and cook until the chicken reaches 185 degrees F. Garnish with the chopped, fresh parsley. Thanks so much for sharing this post on Facebook, Pinterest, Twitter, and Yummly! The olives and capers are my favorite thing about this recipe!